The perfect Friday night or midweek meal. I’m still amazed at how easy and flavourful this taco casserole recipe is, with very little cleanup. This hamburger casserole taco recipe is a new family favourite. Even my non-spicy dad liked it. If you like Taco Bell, this should be one to try out. In saucepan, brown the ground beef & drain (if not extra lean). Add salsa, mayonnaise and taco seasoning; mix well. Bake uncovered at 350°F for 20 minutes or until heated through (sometimes less time, sometimes it’s more cooking time). Just before serving, top with tomato and lettuce & green onions. A nice side dish to serve would be Caesar salad and garlic bread, or a garden salad even though there’s fixings on top, we still enjoyed the garden salad with it, and a nice thick piece of fresh country grain bread. 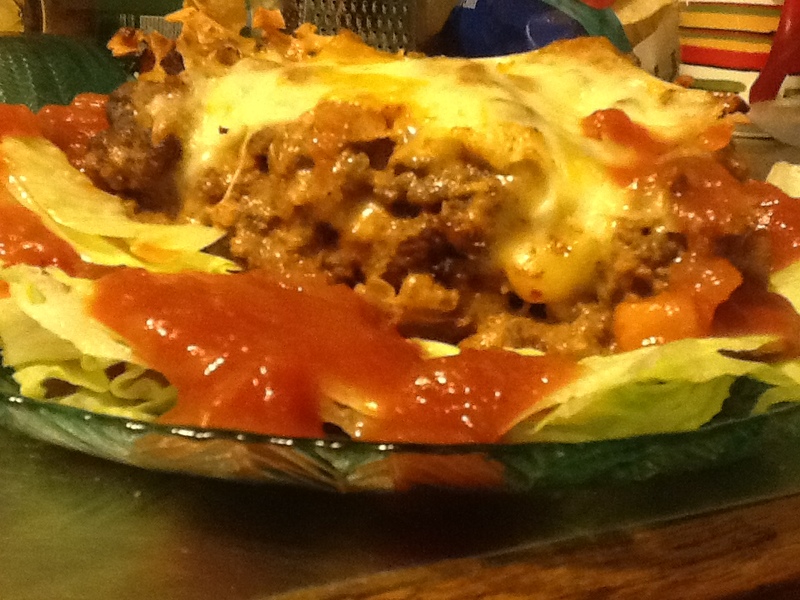 The Seven Layer Taco Casserole Recipe can easily be halved to serve a smaller crowd. Use 1/2 the size of a baking dish as well so that it layers nicely – a loaf pan works well for this. It would serve 3 adults or 2 adults & 2 children who are light eaters.